"Yellow" is the name of one of my favorite songs, a tune by Coldplay. The song is strong and cool and full of love and life, just like the color. The color itself always reminds of my sister and her love for daisies, and of her daughter Eden, who loved yellow when she was a little girl. Yellow can be a tricky color to wear for me in certain tones. The mustard version was EVERYWHERE at a recent blogger conference I attended, in the form of tops, dresses, jumpsuits and more. With my paler completion and blonde hair, mustard is not for me, but it did look fresh and unexpected for spring on everyone who wore it. Check it out if you can rock it. 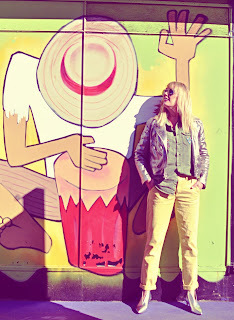 The yellow I love is this sunnier version that I found with these Anthropologie Relaxed Chino Pants. The pants come in 7 different colors, but the yellow grabbed me right away, plus what is not to love about a pair of casual cool chinos? The $88 price tag was a happy middle ground too. They really are the ultimate pants for taking on the day in a laid back, "yeah, I got this" way. 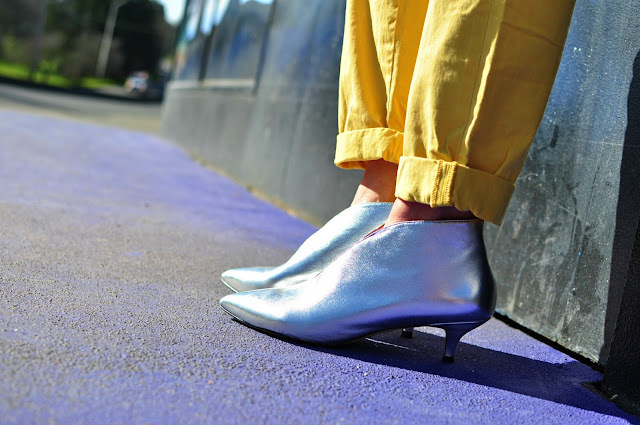 I like things that are unexpected as well, and adding metallics to this look gives it shine in a new way. The silver plays off the bright pop of color chinos. 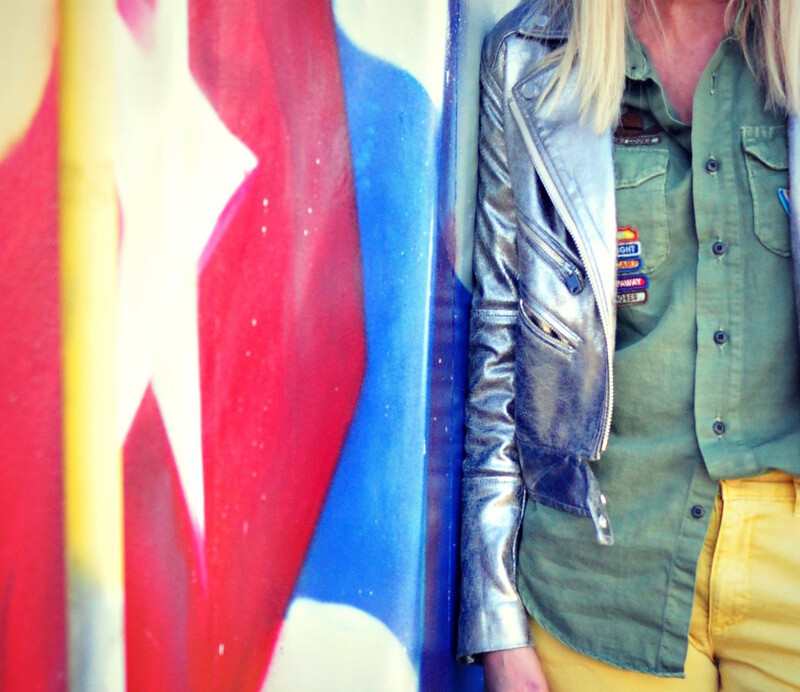 This little silver cropped moto jacket is a go-to favorite of mine from Divided by H&M. 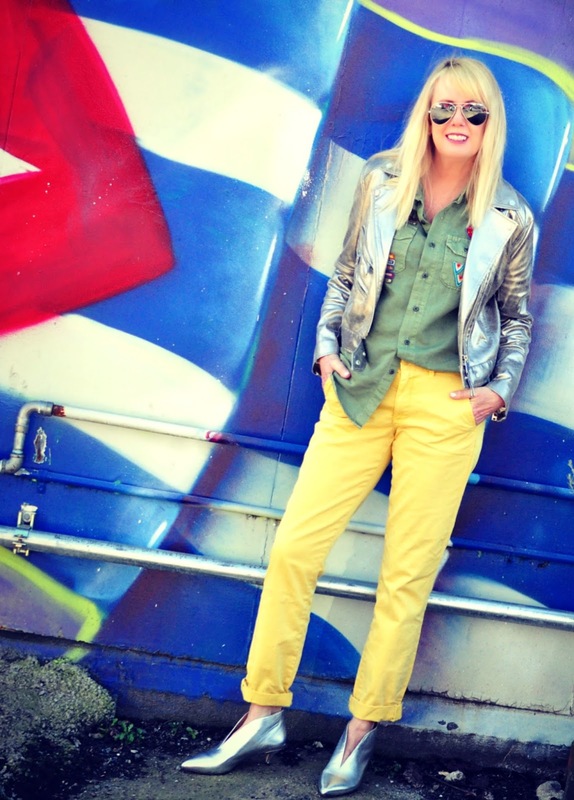 It is no longer available but The Joie Leolani Metallic Leather Jacket is currently 54% off from Neiman Marcus and would be a fabulous upgrade to this look. I wore my Pour La Victoire Kora Nappa Leather Kitten Heels from Saks Off 5th to play off the jacket. I love a cool glove shoe and the kitten heel has made its return...meow! We have been lucky with mostly sunny skies this past week, but I know we aren't quite there yet with spring. No matter what the hue, getting yourself something sunny and bright for your spring closet will make it shine with optimism. Have a lovely week everyone!